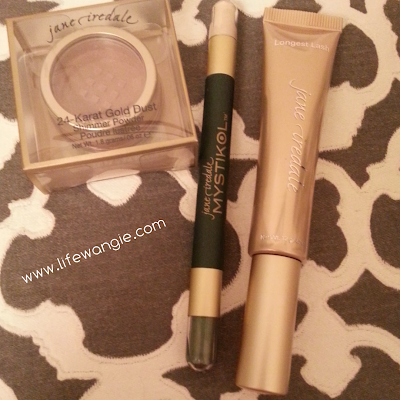 I've received a couple of Jane Iredale lippies in Sample Society boxes recently. I haven't had any experience with this brand before, but they have some really interesting products! I received some samples from the company to review. I received a "24-Karat Gold Dust Shimmer Powder" in Bronze, a Mystikol (more on that in a minute) and a Longest Lash mascara. The bronze shimmer eyeshadow is just fine, and the mascara was pretty good. I really like this new trend of having mascaras in the oblong tubes because I am really tired of mascaras rolling all over the place! But to me, the big news is the Mystikol product. It's really interesting and unique. 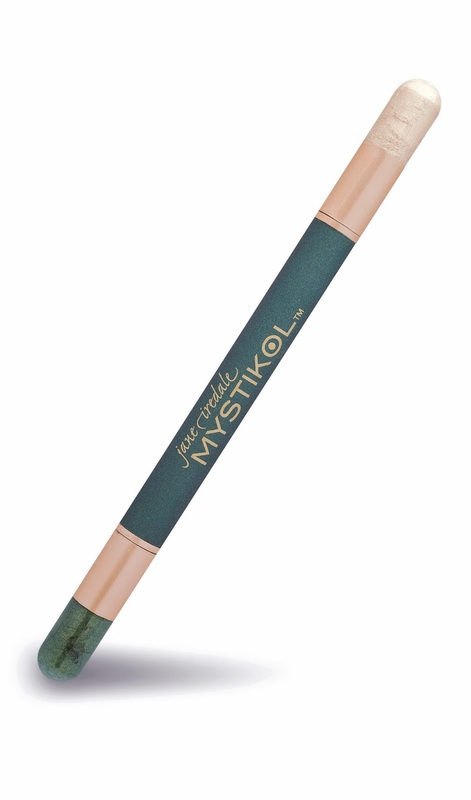 It's a double-ended product with a light color on one end that can be used for highlighting and a dark color on the other end that can be used as an eyeliner. There are several color options available and I received Malachite. What's unique about this is it is not a pencil! When you take off the cap, there is actually a kind of spring-loaded applicator in there that has the product already on it. I think the product is stored in the cap, but I am not sure. The "powdered eyeliner" goes on really nicely and gives the effect of using eyeshadow and an eyeliner brush, but with a smoother and easier application. I tried out the highlighter in the corner of my eyes, where I like to have a bit of brightness but it's usually hard to get a detail brush in there (for me anyway) and it worked great! 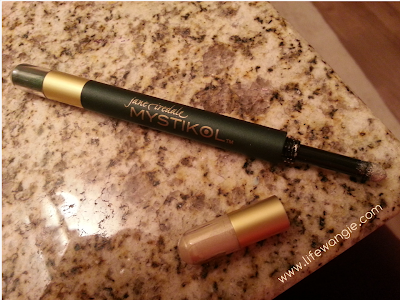 The highlighter is a bit creamier than the eyeliner, but both products give a softer line than a pencil and look really nice if you are going for a softer or smokier look. This is a unique product- I have nothing like it, and I hope some more of these come my way soon.